As the name implies, tobacciana refers to collectibles or antiques related to all types of tobacco products including both cigars and cigarettes. This type of memorabilia takes us back in time to when cigarettes were actually viewed as healthy. Even before that, any well-to-do man was expected to adjourn to the drawing room for a cigar with his scotch or cognac after dinner. During the cigar revival of the late 1980s and early 1990s, the popularity of related collectibles increased dramatically. While the demand for this type of tobacciana is still strong, only the rarest and most unusual items sell for the highest prices these days. For instance, coin-op vending machines known as trade stimulators were an early form of gambling and they often dispensed cigars as prizes. These, especially models from the late 1800s, can sell for tens of thousands at auction when they're in good working order. Ornate bar top cigar lighters can also sell in the thousands, as can salesman's sample books filled with cigar bands and labels. Seeking out individual labels and bands offers a much more economical alternative. Signs advertising cigars have quite a following as well, and often end up in "man caves" as part of a "mantiques" collection. These come in all price ranges, in fact. Many can be purchased at auction in the $300-600 range. Some older cigar tins can also sell for several hundred dollars apiece, while newer examples generally go for less than $50. 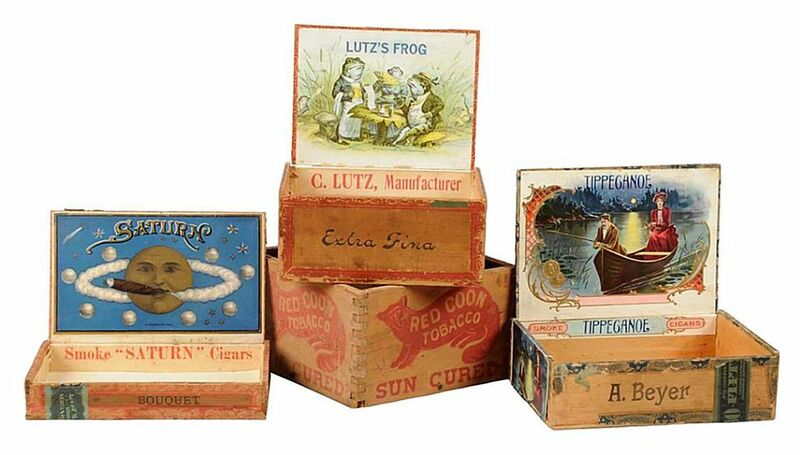 While not generally as romanticized as cigars with their artsy labels and bands, cigarette collectibles do have their place in the world of antiques and collectibles. In fact, some early cigarette advertising found in magazines and the like actually touts them as healthful and promotes their use to calm the nerves. Yes, advertisements in magazines dating back decades actually depicted doctors and dentists promoting various cigarette brands. Smokes were also promoted as a method to lose weight, as in "reach for a Lucky instead." These types of original ads are outrageous by today's standards and continue to be popular with collectors of tobacciana. Many can still be found fairly reasonably priced at shows where ephemera is sold, too. All types of cigarette memorabilia are collected today, including those with Lucky Strike branding among others such as Camel and Viceroy. Some folks look for specific brands, while others simply buy what catches their eye. With more and more establishments posting non-smoking signs these days, some collectibles that were readily available and save as souvenirs years ago, such as advertising ashtrays and matchbook covers, are harder to come by today. Even so, most vintage versions can still be located at estate sales and flea markets quite reasonably priced. Those advertising landmark businesses that have closed their doors, like Las Vegas casinos, for instance, can sometimes be more valuable than the average example but that is the exception rather than the norm. On the other hand, cigarette or boxes and lighters made of precious metals adorned with gemstones can sell for several thousand dollars each. Add a grand brand name to it, such as Cartier or Faberge, and the price multiplies exponentially. When shopping for tobacciana, try to buy the best you can afford. That means looking for advertising tins and signs that have bright coloring and few scratches. Unless a metal item is extremely rare, shy away from rust as well. Paper items should be clean and free of stains. Check posters for foxing along the edges as well, even when framed behind glass. If items aren't in top shape, be sure that the dealer you're buying from has priced the item accordingly. How Much Is Golf Memorbilia Worth? Would You Recognize the Valuable Cremo Pattern as Roseville?